We (IntegrityNLP) have just finished our ten month NLP Practitioner training, which we started way back in September last year. 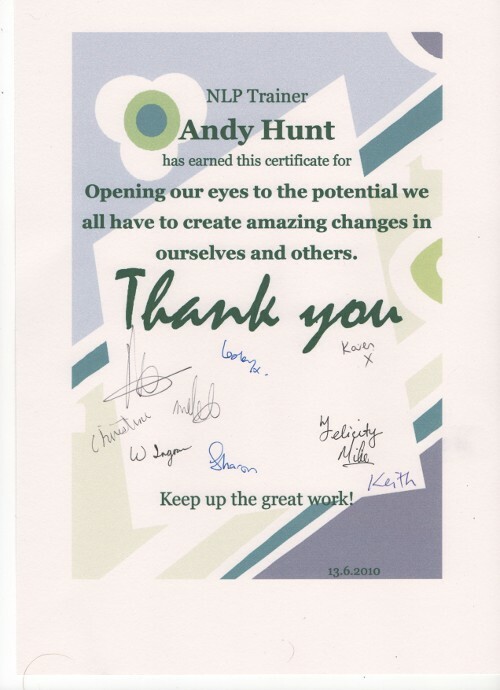 As part of the celebration weekend we normally exchange feedback and hand out the well earned NLP Practitioner Certificates to the trainees. Before we were able to do that our trainees handed Nigel, Harry, Shirley and myself our certificates. You can see mine here. This has never happened before and I am very touched by the gesture. I can’t think of many trainings where the trainees give certificates to the trainers.